The Microsoft-Nokia Windows Phone agreement has sparked a lot of rumors about how deeply the two companies will be integrated. Early on, Microsoft and Nokia said that Nokia's Ovi Maps would "be a core part of Microsoft's mapping services". 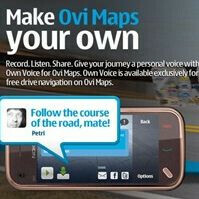 But now, a Nokia insider has said that Ovi Maps will completely replace the back end of Bing Maps. After Microsoft has spent so much in developing their competitor to the seemingly untouchable Google Maps, it seems odd to drop it in favor of Ovi Maps. But Bing Maps represents a significant ongoing expense, so Microsoft might not mind unloading it. Search Engine Land sought a response from Microsoft on the matter, but Microsoft provided a softball response at best: "Bing Maps has utilized Nokia content for road data, geo-coding and routing services for several years, through Nokia's Navteq vector data business, relying on the quality of its data for core location services. The Nokia/MS partnership will enable deeper collaboration in the future." Several people at Navteq and Nokia had similarly vague responses, saying that the details of the reorganization haven't yet been worked out. We shouldn't take this insider's tips as facts just yet. But it would be a logical way for Microsoft to make their mapping efforts more efficient. Unfortunately, it would also mean that many Microsoft employees could lose their jobs. Having never used OviMaps my $0.02 is if it's better, you use it now and spend all your money on R&D to make your maps product on the level of google's, focus on just improving it but get a better product on the market now. This would truly rock. Bing Maps is useless in Europe and it will remain useless for the foreseeable future. Better to cut losses (the investments made in Bing Maps) and invest in something which is much more capable and useful *now*. I highly doubt so. It will probably replace Bing Map entirely... for Nokia Windows phone only. It is the only way to differentiate Nokia Windows phone from other manufacturers (HTC, LG, Samsung, etc). Just like LG got its Korean input, DLNA apps in LG dedicated marketplace. IMO, Nokia won't be so dumb to let other manufacturers to use their Ovi Map, after all, Nokia Ovi Map is one of Nokia's "unique apps" to differentiate from other phones.